It's a social website that connects people that have space to spare with those who are looking for a place to stay. Basically, its a rental website for travelers, with personal twist. Right now - you can rent from people in 34,183 cities in 192 countries. Don and I are heading up to NYC this week. We all know NYC is expensive, but I always seem to be reminded just how expensive it is when I look for hotels. You have to hemorrhage money to stay in a 200 square ft box. 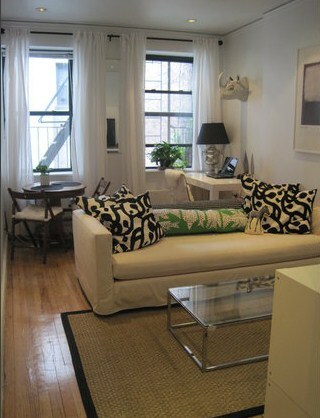 Instead we booked this sunny 1-bedroom in the West Village that was cheaper (and bigger!) than any decent hotel we could find! But you don't have to even spend that much money - you can rent a room in someone's home or even share a room with another traveler for even less cash. It makes the experience more personal. When we used airbnb to stay in Savannah, GA, the owner met us upon arrival to give us the keys. He toured us around their charming row home, showed us how to work dishwashers, dvd players, etc, and even had stocked the fridge with waters and a cheese plate! I am a sucker for cheese, btw. He also had made a printed map of the downtown area with a "locals pick" of bars and restaurants and other stores off the beaten path. Such a help for our first visit. The beauty of airbnb is that you have a profile and the host has a profile. When I look at apartments, I usually don't pick places that haven't been reviewed yet, and def don't pick places that don't have perfect reviews. With so many choices of places to stay, I personally don't feel like taking that chance on an iffy one. After your trip, you will get the chance to review where you stayed, and the host gets to review you. For example, we stayed at this AMAZING art deco apt in LA. I am kinnddaa a neat freak, so I did a lot of cleaning up before we left, even though I knew they would be getting professionally cleaned (since you pay a cleaning fee when you book). Our host left us a really nice review saying that we left the place cleaner than we found it. So in the future, when we request to stay somewhere, the host will look at our profile and see positive reviews and be more likely to accept our booking. Make an account, search for places, book, confirm via email with owner/host, done. Every apartment/house we have stayed in has been stocked with towels, sheets, shampoo, hair dryers, etc so you don't have to bring anything and have to buy little. Go to the website - www.airbnb.com - their website is very user friendly. Set up an account for yourself (don't put in that pic of you doing a beer bong because you want people to rent to you!) and then presto - start to search for your next exotic trip. Andrew, Josh, Colleen - SYB trip to the Maldives?? Just say the word! Have any great airbnb recommendations for surf trips, ski trips, etc?? Shoot us and email or post a comment!